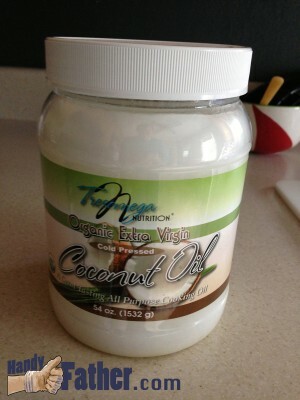 Home » Handyman Blog » Cooking » The best oil for cooking: Coconut Oil. Many people know by now that Canola oil is one of the worst oils for human consumption. Some countries even use it in their vehicles! This blog post is not really about the bad oils though, rather, the oil that we settled upon. To tell the truth, we settled on two different oils. Safflower oil and coconut oil. We found these to be the best oil for cooking as well as being healthy for human consumption… an important quality for something we are eating on a regular basis. Coconut oil is a great tasting all purpose cooking oil. Use coconut oil in place of butter, margarine, and other cooking oils when baking recipes or when sauteing and frying. I love fresh baked brownies. If you’ve ever looked at boxed brownie boxes in the store, you’ll find that there is a common ingredient every brownie package requires. Vegetable oil. Guess what? You don’t have to use vegetable oil! Any oil will work just fine. My favorite oil to use for brownies is… you guessed it! Coconut oil. Not only is coconut oil great for cooking, it is the best oil for cooking brownies. Hands down! Baking brownies with coconut oil will produce brownies with a subtle coconut flavor. Coconut oil goes great with countless other recipes. Find some other Coconut Oil Recipes here. Coconut oil is probably my favorite oil. It is also expensive. The best price I’ve found for extra virgin organic coconut oil is $15.88 for 54 oz. I get this price at Sam’s Club™. If you don’t have a membership to Sam’s club, you can purchase coconut oil online , or any most any health food store, and even Walmart.